If you have a P.F. 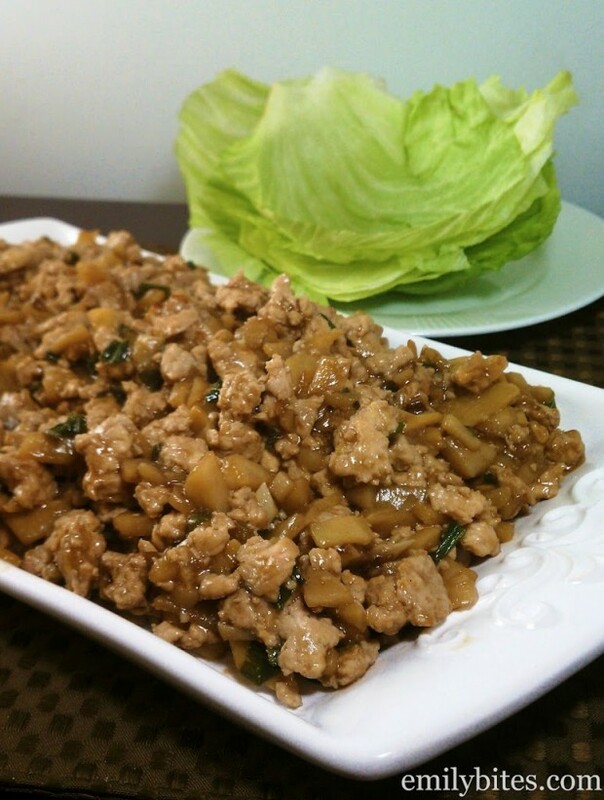 Chang’s nearby, you’ve probably heard wonderful things about their chicken lettuce wraps. Personally, they’re the only dish I order there because they’re my absolute favorite. Needless to say, when I found a recipe claiming to be an almost exact knockoff of the restaurant’s famous dish I was pretty excited to try it. 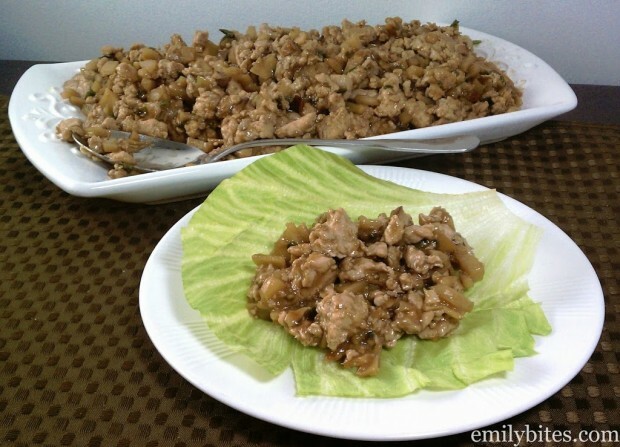 I did make some adjustments, both to make it more authentic (ground chicken instead of diced) and healthier (I used way less oil) and it really did taste very close to the original! Don’t be intimidated by the long list of ingredients, many of them are repeats. It just seemed simpler to separate them by cooking step. P.F. Chang’s serves their lettuce wraps with a mixture of sauces that appear on every table that you can add to make the dish spicier or more flavorful. I’m not really sure what’s in their mystery combo, but if you’d like to add some heat I suggest adding a bit of Sriracha or chili oil, and if you’d like them to be a little sweet you can add a drizzle of Hoisin (like Asian barbecue) sauce. If you like P.F. 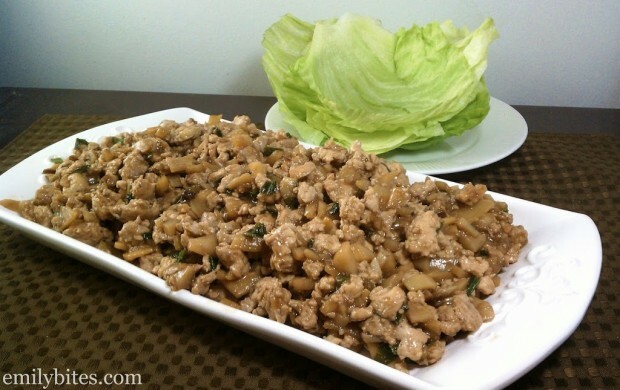 Chang’s lettuce wraps you are going to love making your own at home! In a medium bowl, combine marinade ingredients and stir until mixed. Place raw chicken breasts into a food processor and pulse until chicken is ground. Add ground chicken to the marinade and stir until chicken is thoroughly coated. Let sit for 15 minutes. While chicken is marinating, mix all the ingredients for the sauce until thoroughly combined and set aside. When chicken is marinated, heat a tablespoon of the canola oil over medium-high heat in a wok or sauté pan. Add the chicken and cook, breaking up the chicken with a spoon, until the chicken is cooked through. Remove the chicken from the pan and set aside. Put the pan back on the burner and heat another tablespoon of oil. Add the ginger, garlic and scallions (this step will smell amazing!) and cook for a minute or two until fragrant. Add the mushrooms, bamboo shoots and water chestnuts. Cook for another 2-4 minutes and then add the chicken back to the pan. Pour the prepared sauce mixture over the top and stir until chicken and vegetables are coated. Cook a few more minutes until heated through and sauce is thickened. Emily, we are definitely making this this week. Julia is super excited! Mmmm. Am I wrong in thinking one of the things is something mustardy looking? Soy sauce and chili oil sound right (and I actually have both!). Maybe I should try mixing them with rice wine vinegar and see how it turns out! Thanks so much for your comment, Mary. I hope you end up cooking some recipes from my site. Let me know! Also, I’ve made a ton of stuff from your blog and love it all! The lasagna is one of my favorites – I also made the layered pasta bake for my family this weekend and they loved it. Thanks for all your wonderful recipes! Thanks Sarah! I haven’t made lasagna in forever but it’s one of my favorites too – now I want some! I hope you love these – let me know how they turn out! You may have saved me from a trip to PF Changs. We just watched Todd Wilbur’s Copycat Recipes chicken lettuce wraps episode, and I had already put your recipe on the menu for the week. They were delicious. I served them with stir fry veggies, and mini chicken egg rolls. Thanks again for another hit! Oh – we made the “table sauce” using Chinese mustard, garlic/chili paste, rice wine vinegar, soy sauce, and a dash of sesame oil. Ooh, I’ll have to try that – thanks Lori! I do not have a food processor if I just buy ground chicken from the store will it come out the same? As long as you find ground chicken that’s 100% breast meat. I have trouble finding that in my grocery stores, but I know some places sell it. I like to grind my own because then I know exactly what’s in it, but any ground chicken breast meat should work. Made this tonight and it was huge hit!!! Thank you!!! I also offered peanut satay sauce as an option to add!! Making these tonight! I love to cook and I am hoping these turn out good! What do you suggest serving with them, as side dishes? These were so good!! For the side dishes, I used potstickers, cilantro lime rice and marinated asian veggies that were marinated in a asian toasted sesame dressing = YUM!!!! I’m only guessing but I think it’s Soy sauce, Chinese mustard and chili garlic paste. Chili garlic is not too hot so if you want more spice add more mustard. Just made these and they were awesome! Thanks so much! Can’t believe how much these taste like PF Changs! I’m not huge on Mushroom so I left that out and ended up adding a tad more sesame oil (because I totally LOVE sesame oil) and they are fantastic! I had some trouble getting the lettuce to tear in nice pieces so I’m thinking next time I may just shred the lettuce and eat it as a salad. A+ recipe and I see this saving me a pretty penny! Thank you! What about the white crunchy noodles that are in the chicken mixture? Question about the soy sauce – since there seem to be 2 types. Are you referring to the traditional kind like Kikkoman. Or like LaChoy? They both taste so different and I’d hate to use the wrong kind!